Table Difficulty Factor (TDF) for measuring table "toughness"
Should be very interesting. I can’t wait to try them out. Follow-up. I’m back home and these pocket thingies came in the mail. I installed them and now my pockets measure 4” at the points, 3 1/4” at the throat, and 1 1/8” shelf. By the tdf calculator, it’s now at 1.20. I’m not really seeing a huge difference in difficulty though. Yes more balls hang, but it isn’t the huge difference I was expecting. I’ll get around to doing a product review in that forum after I’ve played on them for a couple of weeks. Obviously this is not intended to be added to the list. I just thought I’d show them since I hadn’t seen them before. I had to crop a lot of the pics out to get them to load but it worked. Last edited by peppersauce; 07-18-2018 at 07:14 PM. What's the main purpose for the pad in the bottom of the pocket? Is it to keep the balls from picking up scuff marks? Or does it reduce noise (to not bother others in the house)? Thanks for posting the new images and measurements. Now get back to work on the BU Exam Challenge (after you take off those pocket thingies). Thanks for posting the new images and measurements..
It’s mainly to reduce noise. It’s just a car wax applicator pad. As an added bonus, the pad actually keeps the balls a little cleaner. They start getting brown from all the dirt and oil after a while so every couple of months I take them out, run them through the washer, and they’re good as new. I almost took all the donuts off my table when I got back home. I haven’t really felt like getting back at it, but I’d still like to beat my last personal best before the exam challenge ends. Last edited by peppersauce; 07-22-2018 at 04:32 AM. Hello Dr. Dave....wanted to add a special table to the list. I was recently able to obtain Earl Strickland's former practice/match-up table, the 10 foot Gold Crown from Steinway Billiards in NYC. This tale has seen it's fair share of great players play on it and I am really proud of the history behind it. I had it delivered and installed with the rail/pocket dimensions untouched from what Earl requested when he asked for the table. To give a greater appreciation for the calibre of play these players show on this table in the numerous videos on YouTube, I felt having the TDF stats registered in your list would do just that. Because this table is not easy by any means. Also, not indicated in the TDF statistics is the side pocket size which measures at 4.75 inches, which makes it a quarter inch tighter on the sides than a diamond table. 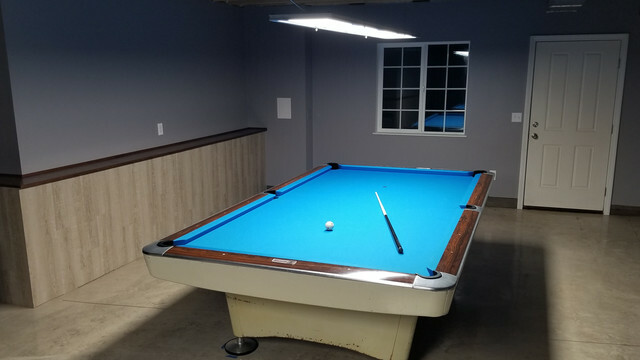 I will create another thread on this pool table project I'm just finishing up on, so there will be more photos and details to follow. But it all starts with registering the TDF on your list. Cool! Thank you for posting it. Here's a mobile-friendly online tool (created by "Isaac") and an Excel spreadsheet for automatically calculating the TDF factor from three pocket measurements to determine the difficulty level of a table. Based on ideas from previous threads on this topic (tight pockets thread and pocket answers thread), and based discussion in the Billiard University (BU) thread concerning how to account for table difficulty in scoring and rating drills like the BU Exams, I decided to create a system for determining how difficult a table plays (based on table and pocket geometry only). It is described in detail in the Table Difficulty Factor (TDF) document, which is convenient if you want a printed copy. The Table Difficulty Factor (TDF) is a percentage measure of how difficult or easy a particular table plays. It is based on table size and the three corner-pocket measurements illustrated below. If the cushion is not 2” (5.1cm) thick, measure the throat size 2” (5.1 cm) back from the cushion noses. You can lay down Post-It Notes or masking tape to better define the lines and intersection points to help with the mouth and throat measurements. 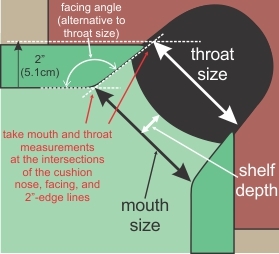 If you have an angle-measurement device, you can measure the facing angle directly instead of measuring the throat size. The pocket shelf depth should be measured from the pocket mouth line to the slate top lip edge (where the pocket opening first starts). Four factors are used to account for table size, pocket size, pocket facing angle, and pocket shelf depth. Each factor is a number less than, equal to, or greater than 1, where 1 indicates average or standard. By multiplying the four factors, you get the TDF which is a good measure of table “toughness.” If TDF=1, the table has an average level of difficulty; if TDF>1, the table plays more difficult than average; and if TDF<1, the table plays easier than average. We just had our Snooker Table (for golf) recovered with 860 Simonis. It is slow, slow, slow. I don't know what the old cloth was, but someone said it was Gorina. Anybody got an idea of what's better than Simonis 860 for speed. Simonis 760 is faster than 860. I have not had any experience with Gorina. Granito / Gorina Tournament 2000 blend is way faster even than Simonis 760. We had it on our tables here for a few years. HR is in between 760 and 860. This is the 10 foot Diamond in the Sun City West, AZ Rec Center.